This idea from Pinterest is super simple to make and smells absolutely delicious. Cocoa Butter is a fat extracted from the cocoa bean used to make chocolate. It is high in antioxidants and fatty acids to help with skin conditions like dry skin and rashes. Coconut oil contains anti-bacterial, anti-viral and anti-fungal properties. This is great for mild diaper rashes, dry skin, cradle cap and massage oil. Both ingredients mixed together make a fantastic baby body butter. 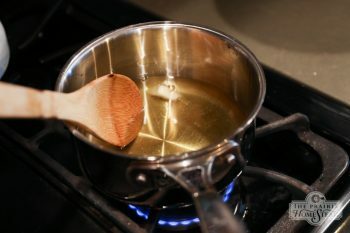 In a saucepan, heat the coconut oil and cocoa butter until melted. Pour the melted mixture into a container and stick it in the fridge for a while until it firms up and hardens. 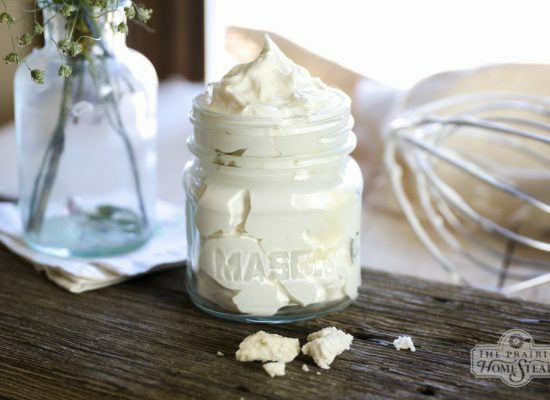 With a hand mixer, whip the mixture until light and fluffy. Leave on kitchen counter for a good 30 minutes, then rewhip with the hand mixer. Do this two or three times for more creamy results. It also helps to make the butter less “oily” when applied. Buy mini glass containers with lids from the dollar store or amazon (or even small mason jars) to divide your samples of lotion. Make sure to store in a cool area. If it gets too warm and melts, simply place back in the fridge and re-whip.